This 574km stretch of gravel, mud and stones is the only road that crosses the Arctic Circle in Canada. Rain was in the forecast and it wasn't long until it caught up to me. It will be several days before I see pavement again or get a cellphone signal. As I climb the North Forks pass in the rain looking to the side as the trees give way to the tundra, a car pulls over. I've met these people before in Yukon, they drove to the arctic circle but turned back because the road was too bad. As I cross the mountain pass I enter a different world. The clouds cover the Ogilvie mountains but just enough so that one can see the barren peaks. It was drizzling and it was perfect. My feet are wet and my hands are cold but the beauty surrounding me makes it all alright. I slowly turn the cranks and just look around. Very few cars pass me by and I wonder if people who are driving enjoy this scenery the same way that I do. The above-mentioned rainbows and sunshine! Getting food from strangers on the road is not about the calories. A smile, a wave, or a friendly honk is all it takes to lighten up a cyclist’s day. And most people do just that—maybe that’s why I’ve made it this far. My last chance to fill up water for the next 120km. I wake up to a cloud filled river valley, the sun is out and I am looking forward to being reunited with the food that I had sent ahead to Eagle Plains lodge. “We were just wondering what that rattling sound was...” That was me. The road had gone from bad to worse, and going at 10km/h was considered good. This was the third time I ran into this couple from Whitehorse. They always offered me water and food. With the next place to buy batteries about 500km away, I got lucky! The whole business of giving and receiving goes both ways. My “kindness of strangers” debt was increasing, and I couldn’t wait for the opportunity to do my part. 1. FLYING STONES—go to the side of the road, turn around and cover your face. An eye-patch and a cool story to tell is not worth losing an eye for. 2. DUST—Neither you nor other drivers can see anything. Oh, and take a deep breath! I expected to arrive at Eagle lodge at 6pm, get the food that I sent ahead and find a spot to camp near the river. Now it was 10pm, it was cold and I was tired. I spent all day on the worst road that I have ever seen. Just three months ago I broke both wrists and my collar bone—I had rescheduled my last post operation check up to go on this trip. The doc said I would be fine to cycle across Canada. He didn’t know that I would ride 10-11 hours and cover an average of more than 160km per day. I was talking to two natives from Inuvik who were here to hunt some caribou. Gordon and Bill had met me on the road earlier and were now inviting me to stay in their motel room. They had paid $180 for two people, but they had three beds. We quietly wheeled my bike through the narrow corridors and into the room. The forecast printouts in the motel lobby were showing 50km/h winds, gusting to 70. I didn’t look at the temperature, after all it was summer. I would just ride as much as I could and then camp—I could not afford to wait here. Two hours later as I reach the Arctic Circle, I am wearing everything I own. I find cover from the wind behind this sign and eat cold pasta with meatballs and some crackers. I have to get moving again, I would freeze if I didn’t. I was at Rock River campground and I had told two people from Inuvik that I wanted to get to the ‘Welcome to Northwest Territories’ sign and camp there. “What are mittens?” Maybe it was the cold, as I knew I had heard this word before, but now I wasn’t sure. She went to her car and came back. Mittens. Unfortunately for me, life is not like math and two negatives don’t cancel each other out. There was light rain, which as I gained altitude turned to flurries of snow. I was getting thrown side to side by the gusts and the constant headwind was telling me to go back. I didn’t. Instead, I turned up my music to dampen the screeching sounds of the wind and continued pedaling, sometimes wondering, "What else can I do? Turn back and go home?" In the last two hours only two cars passed me, and both stopped to see if I needed help. “I’m okay,” was my reply, giving them the thumbs up. They must have thought I was crazy. I thought, “If I get a ride, I might as well get one back to Ontario. I will not give up.” As you can tell by the look of my face, eight hours in the wind had drained me. I had been told stories of the mountains and how quickly the weather can turn, leaving even experienced climbers in tricky situations. My hands and feet were cold, but they were hurting and that was good—it meant I could still feel them. It was August 23rd and the temperature was below zero. Unlike the Arctic Circle sign, I couldn’t go around to the other side to read it—it was too cold. My dinner was again cold pasta, and I was pacing back and forth in the cover of the signpost. I briefly considered camping behind the sign, but it still wasn’t offering good protection from the wind. I would have to continue. A pickup truck pulled over. They told me there was a bear about 5km down the road. As I enter Northwest Territories I get a better view of my surroundings. The rain had kept this hidden from me, but now it was my turn to enjoy it. I am shivering and I begin to sing songs from Bulgarian Folklore—songs I have known since childhood. Bulgaria. I have not been home for 10 years. My clattering teeth interrupt the lyrics but I am still going, and it seems to keep me warmer. This is no American Idol, and there is nobody to hear me, except the Grizzly. I hope she hears me. I scan left to right looking for the bear, and I make a fist in my mittens to warm up my fingers so that I can take a picture if I see it. Despite the cold, despite the wind, and despite the bad road—this is amazing, I have once again entered another world where the only thing that matters is staying warm. Staying warm and moving forward. It was too cold and cycling wasn’t warming me up. Pushing my bike off the road helped, but I was still not prepared for winter. I walked about 100m further onto the Richardson mountains plateau and set up my tent. Bungee-corded it to my bike so it wouldn’t fly away. I put my food bag away from my tent and went to sleep. The relentless wind was shaking my tent and piercing through my sleeping bag. I was cold and miserable, turning my back to the wind did not help, neither did piling the two panniers on my side or wrapping my jacket around the sleeping bag. 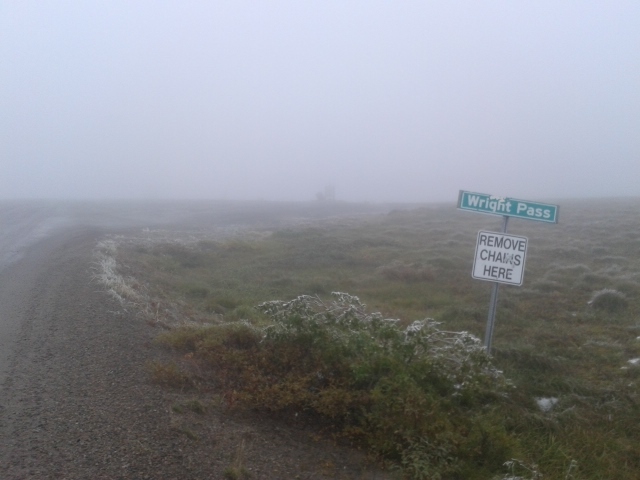 I knew camping on the mountain plateau was a bad idea, so was biking today in the first place. I must have fallen asleep, but then I woke up again, and now it was really cold. I looked at my phone, it was 2am. Then I remembered the emergency blanket, given to me by that stranger in BC. I ran out to grab it. There were no birds chirping to wake me up in the morning, gone were the mosquitoes too. It was the wind, still trying to lift my tent off the ground. But I made it! I was still a bit cold and a little wet, but warm enough to sleep. That traveling musician from British Columbia saved my life, and I don’t even know her name. I still had to ride into it, and what about that bear? At last, the Northwest Territories welcoming committee. As usual I took out my camera. The bear seemed uninterested but it was still heading toward me. Up here bears have the right of way—especially when you are on a bicycle. I looked around and saw a road leading to a maintenance camp. I knocked on the door. A woman came out and hopped into her car to take photos. Out of the corner of my eye I saw a shadow. I looked up and forgot about all about the bear. An eagle flew above me. Unlike me, he was not fighting against the wind, and his movements were graceful... He had been doing this for a long time, and it was his massive wingspan that drew my attention. The two alpha predators, each in their own domain made the whole scene more surreal... was this really happening or am I still in my tent? Frozen? I wasn't frozen but I would be if I didn't get moving. Meanwhile the bear had passed. I went towards the woman in the car and caught a glimpse of the beast going in the bush. She told me that they can strike out from the bushes—I didn’t wait to find out if she was right. Call me crazy but I had really enjoyed the last two days, climbing a mountain pass battling storm-wind against me, barely making it through the night, the bear, the eagle and now I am riding into snow, in August! There is absolutely nothing that can stop me now. Look! There is some road on those stones. Who was John? An SUV had stopped near me. A bus approaches. No, it’s an RV. I had met John before on his way north and he had given me granola bars, fruit, juice and home (RV-home) made banana bread. They didn’t tow their car behind the RV because it was too muddy further north. I was standing in front of a yellow and brown building with the following sign “Tetlit Zheh, Christian Fellowship”. I had met Paul’s daughter in Yukon and she had suggested I might be able to get a warm bed and a meal if I made it up the Dempster. Paul invited me in, treated me to a big meal and showed me where to sleep. Why are people I have never met so kind to me? The deckhand of the Mackenzie river ferry knew my name, but how? Well, I am bad with names. I really need to work on that. A truck pulls over, and I realize how loud those things are. “Are you hitchhiking?” I yell out. I was very interested in the subject because I would l have to do it if I wanted to get to Ontario in time. She wasn’t, and from what I could hear over the loud noise of the truck she was writer from France, traveling and doing research for a book. She began asking questions and then we exchanged photos. A few kilometers ahead and the truck stopped again. We started chatting, and she also told me that she would be staying in Inuvik. It never crossed my mind that she wanted to meet me and hear my story or that I even had a good story to tell. Inuvik—the end of the road. I could post a photo of the ‘The Dempster’ sign or the igloo church, but that would be too generic. It was 11pm and I was talking towards a stranger on the street. Taking pictures of the prices in the grocery store is another “tourist” attraction. And that was it. I wasn’t here to pay $500 for a 20 minute flight to dip my feet in the Arctic Ocean or to lift my bike over my head. Instead, what I’ll remember from Inuvik is the stranger on the street that night. Meeting Gordon who invited me to stay in his motel room two days ago. And the four cyclists who were ahead of me and had a grizzly encounter with... well, a grizzly bear. 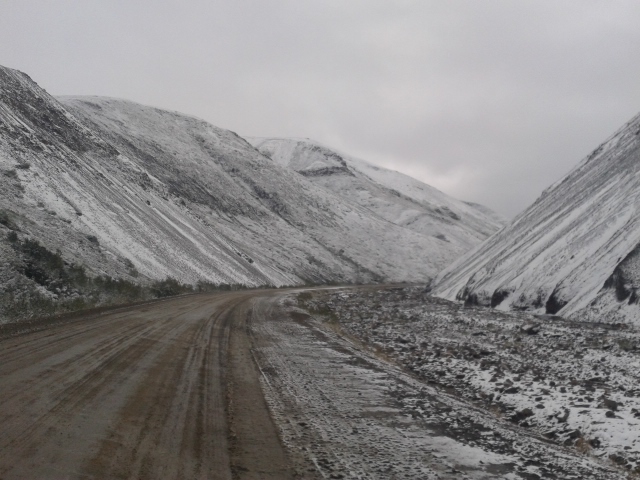 THE DEMPSTER HIGHWAY: uncut and unedited.